The Andes and Amazon Odyssey will take you from the Amazon Basin to the spectacular Andean Highlands, while staying at some of Ecuador’s most renowned and sustainable accommodations along the way. By discovering Ecuador’s unrivalled diversity and scenery, this journey will surely travel beyond your expectations. Expect to indulge and to have the experience of a lifetime! Observe fascinating hummingbirds from very close distances in the green, lush cloud forests of the Eastern Andes slopes. Enjoy a canoe ride on the Napo River, one of the main tributaries of the great Amazon River. Hike through tropical rain forests, observe the diverse Amazon wildlife, and come in close contact with the native Indian tribes. 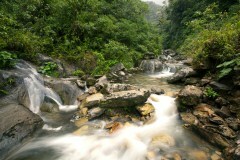 Observe dramatic waterfalls and view the untouched cloud forests of the Sangay and Llanganates National Parks. Be amazed by the spectacular views and breathtaking waterfalls of the Baños Valley while relaxing at the outdoor pools and Jacuzzi with hot volcanic water.Enjoy splendid scenery such as the beautiful snow-capped Cotopaxi Volcano, the active Tungurahua Volcano and jungle volcano Sumaco. 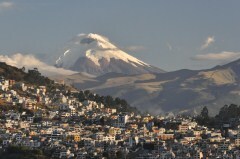 Day 3: Transfer from Quito into the Andes Mountains via spectacular volcanoes. Spend the evening in Ecuador’s most beautiful thermal hot springs resort. 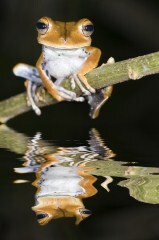 Day 4: Morning transfer into a spectacular cloud forest with great bird watching opportunities. Continue to your Amazon Lodge where you will have an evening activity. Day 5: Amazon Lodge: Day of activities included. Day 6: Transfer from the Amazon Rainforest to Baños via the Pastaza Corridor. Optional afternoon activities or massages available at your luxury spa hotel where you spend the night. Day 7: Return from Baños to Quito via the Cotopaxi volcano. Overnight in Quito. 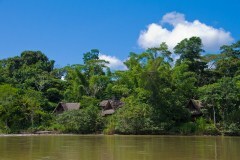 Upgrade your Amazon stay and stay at one of South America’s best lodges like the Napo Wildlife Centre. Add in another day to enjoy the excellent views and relaxing spas in the Andes mountains. Choose from our range of trips to the Galapagos Islands which will combine perfectly with this tour. On arrival in Quito you will be met by our representative and transferred to your centrally located hotel. After breakfast, your guide and transportation will pick you up and take you on a comprehensive walking tour of the Colonial District of Quito. On this tour you will visit some of the most famous squares, churches and colonial buildings of the city, including Independence Plaza, where you can admire the Cathedral, the Presidential Palace and the Archbishop’s palace. Furthermore, you'll visit the San Francisco Church and the Basilica of Quito, the oldest Church in South America, made almost completely out of volcanic stone. Then head to the 'Panecillo Mirador', the most famous hill of Quito, where you can take pictures of both colonial and modern Quito. While walking through the city, your guide will help you appreciate the eventful past of Ecuador, including the Inca Empire, the Spanish invasion, and its push towards independence. Return to your hotel with the afternoon and evening at your leisure. We leave Quito in the morning and start with a drive up the Eastern Cordillera, where we’ll pass over a 4,065 metre mountain pass. It can be foggy up here but when the weather is clear you will be amazed by the magnificent views of the Antisana Volcano and the surrounding Paramo Wetlands. Within two hours we will reach Termas de Papallacta, Ecuador’s most beautiful thermal hot springs resort and spa, located in between spectacular mountain forests of the Eastern Andes slopes. Here we will enjoy a very nice morning hike through the surrounding mountain forests and grassy paramo near our resort. This ecological reserve is managed by a local foundation and harbours many peculiar species of flora and fauna (more than 160 bird species, mountain tapirs, spectacled bears and many other species). In the afternoon you will have free time to dip into the amazing hot springs or enjoy some of the optional health and beauty treatments in Termas de Papallacta before partaking in a very tasty meal among peaceful settings. In the morning we will depart from Papallacta to continue through the lush, green cloud forests. We’ll make a stop at an exceptional cloud forest lodge where we can observe many species of hummingbirds. Moreover, we will have the opportunity to see the famous sword-billed hummingbird, which has a longer beak than its body. If time permits we can also make a short hike before we continue towards the Amazon basin. At midday we will arrive at , a lovely retreat located on the shores of the Napo River that offers very spacious and comfortable bungalows built in native design. After a sumptuous lunch, the group will visti the village of Ahuano, whereyou will learn about several aspects of traditional Quichua culture. A local host will show us how to make chicha, a typical beverage (which of course all may taste), and demonstrate the spiritual cleaning rituals still practiced today throughout the surrounding community. Finally, all may participate in a blowgun target-shooting contest – but don’t expect to beat the natives! After breakfast the group will board a dugout canoe, and navigate 20 minutes down the waters of the scenic Napo River. The destination is Cosano where during an approximately two hour walk through primary rainforest visitors will have the opportunity to see actual hunting traps which were traditionally used by the local natives in the past. The guides will demonstrate how they work and explain which type of animals was caught in each one. And of course, at all times we will be on the lookout for tropical birds, and point out important aspects of the surrounding vegetation. Just across the river from La Casa del Suizo is Amazoonico, a rescue center for wounded and displaced tropical rainforest animals. Here it is possible to see coatis, tapirs, and several species of monkey, snakes, and a variety of birds, many of which wander around freely or if you decided to do other excursion Lunch “The Island”: A one-hour walk along a totally flat river island, where one may observe a great variety of plants and insects. This morning we will leave for Baños, stopping in Puyo for a quick tour of a small Balsa wood factory. After Puyo, we will enjoy spectacular views of the surrounding cloud forests, dramatic waterfalls, cliff side farms and untouched scenery of Sangay and Llanganates National Parks. This phenomenal stretch through the Pastaza Corridor has been declared by the WWF as “A Gift to the Earth”. We’ll transition from rainforest to the Andean Mountains in less than fifty kilometres. At around midday we will reach Baños and arrive at Luna Runtun, the adventure spa located on a hill above Baños within the Sangay National Park. Enjoy the magnificent views of Baños Valley, the active Tungurahua Volcano and the inaccessible surrounding mountains that hide the lost gold of Inca Emperor Atahualpa. After lunch at Luna Runtun we will have a free afternoon for an optional excursion such as hiking, mountain biking, horse riding. You’ll also have the option to take a massage or other health treatment in your hotel spa, or just relax in its thermal pools whilst admiring the views of the valley. Today you will enjoy another day full of diversity as we depart Baños and drive along the “Avenue of the Volcanoes” on our way back to Quito. With clear weather we will be able to see at least eleven of Ecuador’s fifty-five volcanoes, and after midday we will arrive at an ancient hacienda for an early lunch. The hacienda was a former Inca fortress and palace from the fifteenth century. Today it still holds original Inca walls and a complete chapel, built in the imperial style of the Incas. 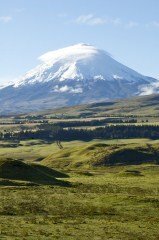 After lunch we’ll continue to Cotopaxi National Park, which is located two hours away from the city of Quito. The Cotopaxi Volcano is one of the most important landmarks in Ecuador because it is the highest active volcano in the world and the second highest mountain in Ecuador, dominating the landscape with a height of 5,897 metres. This volcano has been a place of worship for centuries by the native people of the area who believed Cotopaxi was a god. Situated within a national park of the same name, this beautiful area is a place where the lush, endemic flora and fauna of the area can be observed, including wild horses, deer, llamas, and more. While there, you will have the chance to visit Limpiopungo Lake, located near Rumiñahui Volcano (4,757 metres), or go hiking to observe the birds. Afterwards we’ll begin our drive back to Quito where we will drop you off at the hotel. Our representative will pick you up from your hotel and transfer you to the airport for your departure flight.